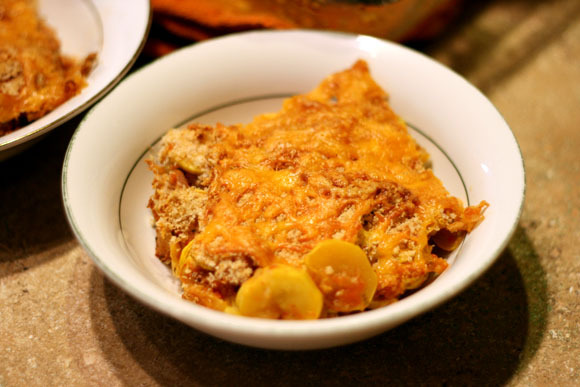 This casserole is a great way to use up extra zucchini or yellow squash that you have! Cook the bacon in a large skillet over medium-high heat until crisp. Add the onions and cook until tender, about 5 minutes. Add the squash and season with salt and pepper. Cook until the squash is tender, about 7-8 minutes. Stir in the tomatoes. Pour into a casserole dish. Combine the bread crumbs and garlic powder in a small bowl. Sprinkle the squash mixture with the garlic bread crumbs. Top with the shredded cheese. Bake for 15 minutes to melt the cheese and heat through.